Humans are creatures of habit. Once we get an idea of how something should be, we will stick to it rather stubbornly. This is as true in parenting as anything else. 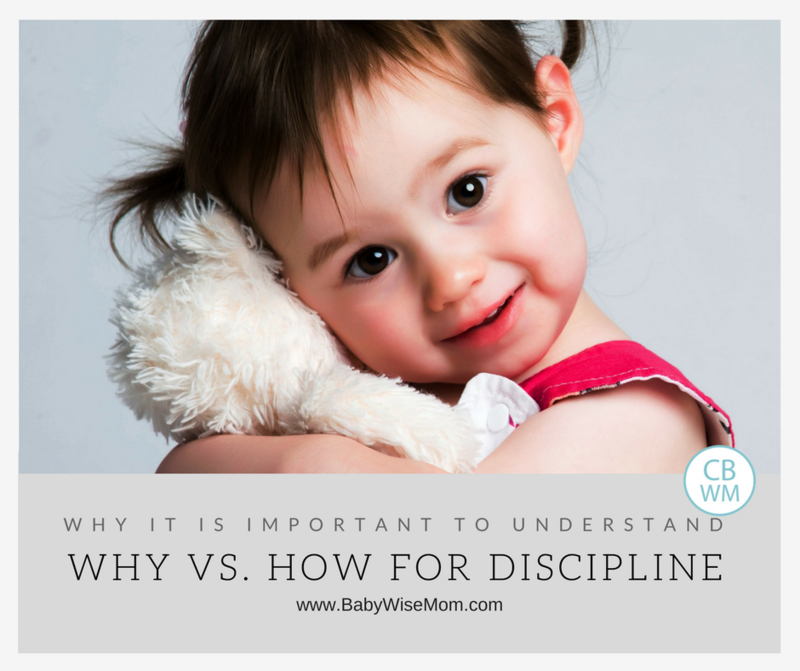 When disciplining your child or solving a parenting problem, it is important for you to understand the concept of why versus how. This post contains affiliate links. 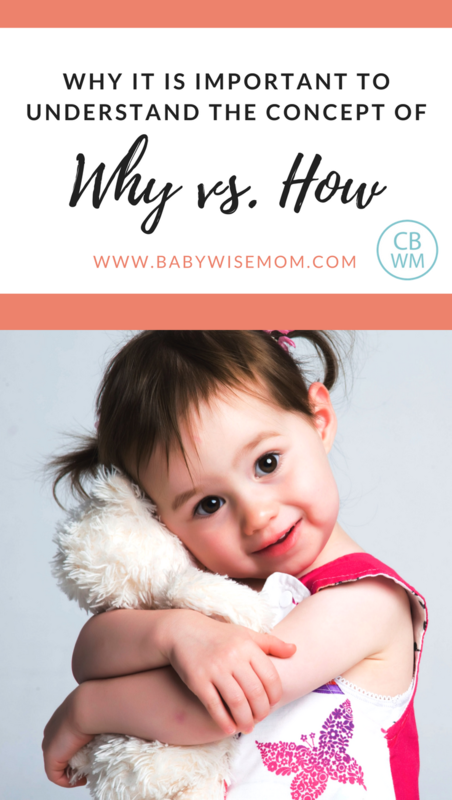 If you have read any of the “wise” books beyond On Becoming Babywise or On Becoming Babywise Book Two, then you know what I am talking about when I say “why vs. how.” If not, I really want to bring this up so you can keep this in mind while parenting. In On Becoming Toddlerwise, there is a chapter titled “The Land of Good Reason” (starts on page 63). This chapter has proved to be so valuable that it is included in the books that follow it. I think this idea of why vs. how can be quite valuable to the mothers with young babies, also. I will summarize the idea here, but if you plan to continue forward with Babywise principles into toddler hood, I would recommend just getting Toddlerwise now and reading it for yourself. Next, you prioritize. I like to focus on one area at a time. Work on your most important goal at a time. You also don’t want a goal that is number 10 on your list to trump your efforts on goal number one. Next comes the how. How is the method you use to accomplish your goal. How has a lot of options. 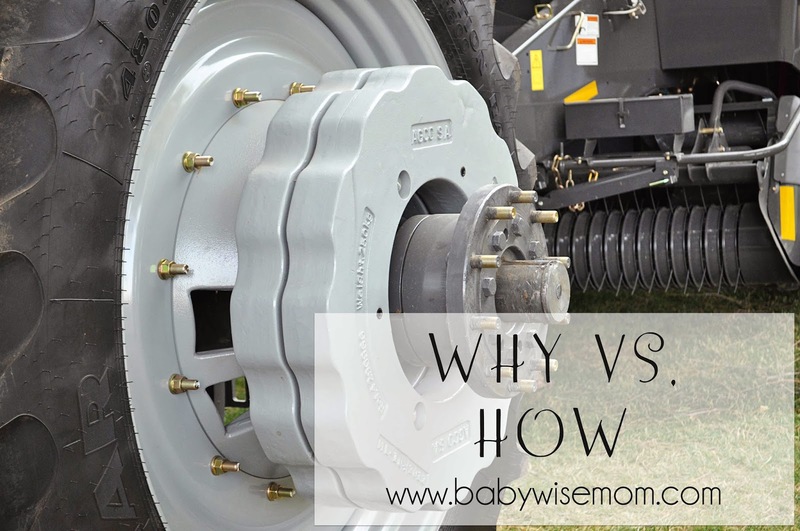 The how that worked for child #1 won’t necessarily work for child #2 (and likely won’t). Your how needs to be flexible. You need to be willing to evaluate your how. How’s it working for you? If it isn’t working, try a different how. The how does not matter–the why matters. Why is more important than how. You know the saying there is more than one way to skin a cat (by the way, I love cats so don’t get mad at me)? There is more than one way to meet a goal you have for your child. It would be impossible for anyone to list every single option. This is why I have stressed the importance of you getting to know your child’s individual personality (Get To Know Your Child’s Personality). You need to be in tune with your child. You need to know what will work to accomplish your whys. Sure, you will make mistakes. It happens. But make the effort to know your child so you can more quickly find the right how. It is great to get ideas from other moms and from books. What “hows” have worked for others? Would any of those ideas work for your child? If not, is there a way you could modify the how to fit your child? Don’t get caught up in why your “how” isn’t working. “Why doesn’t time-out work for my son? What is the problem here?” While there is value in recognizing what about the time-out doesn’t work for your son so you can avoid similar solutions in the future, you don’t want to become so consumed with the time-out issue you ignore your other options. Don’t get so stubborn about time-outs being the answer you fail to recognize the problems with it for your child and move on to something else that would work. Sometimes you come across a new problem you didn’t know was there when you are applying a how. An example in the book is this. You need to make copies for a meeting (why). You go to the copy machine to make copies (how). The copy machine is broken (new problem). So you start trying to fix the copy machine rather than make the copies. In this situation, you don’t want to leave the copy machine broken forever, but your meeting needs the copies before your machine needs to be fixed. You need to go to Kinko’s and get the copies made, take care of the meeting, and then you can focus on the copy machine. Here is an example of why vs. how in my life. When I was training Kaitlyn to sleep when she was a baby, as I have mentioned, there were times I moved her to her swing to take a nap if she wasn’t going to fall asleep for the nap. My number one goal was for her to learn to self-soothe. But I knew that after a certain point, she wouldn’t fall asleep. If she didn’t get sleep, she would be too tired to continue to train through the day. For her, the how of the swing didn’t interfere with her ability to fall asleep next time on her own. However, with my son, it would have. At first I worried about this solution. My good, wise, friend reminded me of the why vs. how and how it applied to the situation. I hope I have made this idea as clear as possible so that you can really take hold of this concept and apply it to your child-rearing. It will really help you to make the best decisions for your little one.